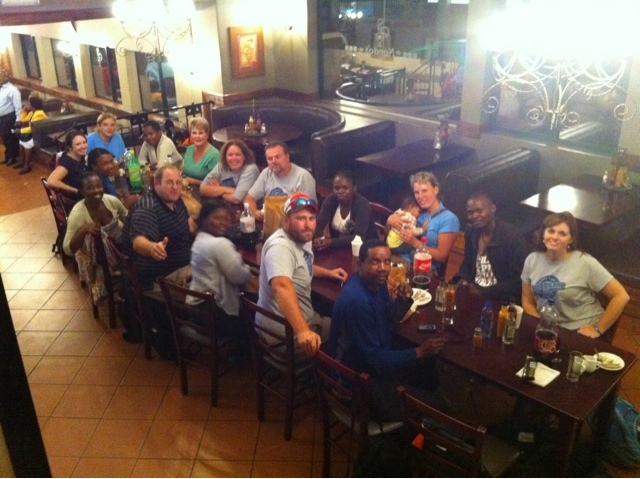 The B-Team had the pleasure of finishing yesterday's ministry at Nando's with the D-Team and the Brock family. Nando's is a fun chicken restaurant that we have visited a couple times this week. The D-Team is the Discipleship team that ministers at the CHC/AIM carepoints. I am so privileged to be able to minister with these wonderful young people. Their positive influence and strong leadership with the kids is extremely evident. Seeing the children respond so well when instructed by Xolani and Cynthia (Bheveni's primary D-Team leaders) was a real blessing to me. Yesterday our team was blessed to be able to share with Bheveni's children the many gifts God provided through you. It was a good, long day of giving!